UTT readers know, this war in which we are engaged with the Islamic Movement in the United States is primarily an Information War. 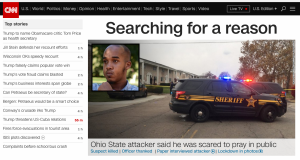 A Muslim refugee from Somalia named Abdul Razak Ali Artan is “scared” to pray so he tries to kill non-Muslims on the Ohio State University (OSU) campus with his vehicle and a knife before being shot dead by an OSU police officer. What he did was legal under sharia (Islamic Law). Its all about sharia. American mainstream media pushes the narrative that we simply cannot know what drove this poor young man. Where are the credible journalists? A Somali Muslim plows over people with his car, then jumps out with a knife yelling allah u akbar. For the media to say they do not know the motive is for the media to be waging an information campaign for the enemies of the United States. Sorry Congressman, this is not “indiscriminate violence.” This is jihad being waged for the purpose of establishing a caliphate under sharia. 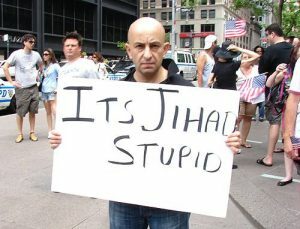 More specifically, this is jihad waged to cause fear to get Americans to further submit to Islam. Abdul Artan was “scared” to pray because Americans were not providing an environment with more room for sharia. Therefore, we get violence. 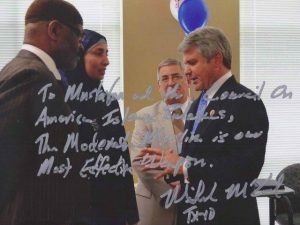 Perhaps if Mr. McCaul were not so busy supporting the jihadis by pushing the CVE program, getting it funded, and doing the business of our enemies, he might have more time to study our enemy and do his duty. Congressman Adam Schiff, (D-CA), the ranking member of the House Intelligence Committee, said Artan “may have been self-radicalized.” What does that even mean? “Self-radicalized?” Abdul Artan was following the sharia which comes from the Koran and the example of the Muslim prophet Mohammad. And Adam Schiff serves on the “Intelligence Committee” for the United States House of Representatives. And of course, in comes Hamas – doing business as the Council on American Islamic Relations (CAIR) – and no one in the mainstream media mentions they are a Hamas organization. No one mentions they are terrorists. 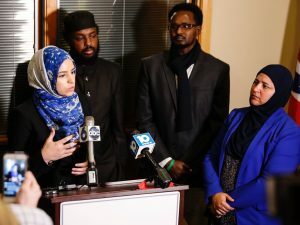 CNN finished their piece by promoting CAIR as a soft and cuddly organization that just wants peace: “As Ohioans, as Americans and as Muslims, we’re shocked by today’s senseless attack,” said Roula Allouch, national board chairman of the Council on American-Islamic Relations…Jennifer Nimer, legal director for CAIR’s Ohio chapter, urged the public not to jump to conclusions about Artan’s motive. Good news is Hamas (dba CAIR) now has 3 offices in Ohio – Cleveland, Cincinnati, and Columbus. Americans elected Mr. Trump because there was some realization our leaders, media, and system has been utterly corrupted. What will happen when they realize their leaders and media are working with our enemies against them with no response from federal law enforcement or intelligence agencies which have also been catastrophically corrupted? Who can we thank for these continuing and increasing attacks? Who can we thank for a disintegrating security in American hometowns? President Obama, Mrs. Clinton, Mr. Kerry, Congressman McCaul, Governor Chris Christie, Governor John Kasich, Senator John McCain, Senator Marco Rubio, and all of the other treasonous officials in the American government who continue to provide aid and comfort for our enemies while denigrating people speaking truth about a clear and present danger to the American people and our communities. It is time, citizens, to understand the threat. Join UTT to educate, train, and prepare America for this growing cancer, so it can be defeated. No matter who is President, this war will be won or lost at the local level. I share your articles on all my social media sites to help people “understand the threat” we are witnessing in the USA. Your information helps put the truth about terrorist events into language people can digest. Main stream media leaves the public miffed by not reporting to us what really is happening. I am thankful and grateful for your loyalty and devotion to help us relate to events that affect our lives and freedoms in the USA! On 27Nov16 the website, “Drudge 2016”, ran a news item which, aside from the vehicular-jihad tactic, described in detail, per narrative, an actual video demonstration of how to cut ones throat & wrist with a knife, and the content of a terrorist mag which described how to do so as well, plus a recommendation by an ISIS associated jihadi leader to begin individual contextual attacks on French, German and American victims. Thus, on 28Nov16, after hearing the usual denial by Fox News regarding any evidence of terrorist involvement, this time regarding the Ohio University attacks, I emailed their newsroom in New York with said content of the previous day’s entry on Drudge. Thirty minutes later, notwithstanding that said email I sent was routinely received I.e. a relevant copy came back, I received a contextual email from “postman” under the rubric “UNDELIVERED”. Furthermore, on 29Nov16, at 0645hrs ET, a Fox newsreader named “Doocy” – in the course of yet another* on-air lapse of sanity by Fox regarding the President elect’s personal safety – revealed the exact path one could follow upon entering Trump Towers in New York to reach said official, I.e. “take the elevator to the 25th floor and go to the corner office” – *see the previous contextual blog I sent to UTT regarding Ed Henry of Fox News. Thanks for this article Mr. Guandolo. On Monday’s (11/28/16) Facebook Live discussion with Tomi Lahren, you were discussing the political figures, some of whom you mentioned above. Tomi asked what these people stand to gain by being advocates for Islam in our country? I don’t think you ever quite got to the answer of WHY they are doing what they’re doing. Is it money? Is it perceived power? Is it because people like Gov Christie and others don’t really like the Constitution? Any help you can give in this area would be most appreciated. Thanks for what you do!!! Wendy, the WHY question has many answers. Why would an American leader support jihadis and the hard-left in this country helping them? Some of the answers include: they are poor leaders and don’t know what else to do besides try to get along and find an “easy” solution; some are cowards; some want to go farther in public office and know if they take on this issue it is a career ender; some are dumb as cinderblocks; some are nefarious – like many of those in the Obama administration – who are red-diaper babies and marxists/communists themselves and want to see the downfall of America. When President elect Donald J Trump has been sworn into office and the tyrannical interregnum created by U.S. presidential eligibility-fraud based on perjury, counterfeiting and forgery, which has spanned the course of American history for the previous eight years, finally ends, a contextually mandated trinity consisting of a special prosecutor, FBI investigators and unassailable experts on Constitutional law should be convened to produce for posterity a factual record surrounding said crimes. Furthermore, since criminal profiling and the “stop & frisk” tactic when used as investigatory tools for enforcing the law are as indispensable to success as are music notational skills for scoring an opera, the 120 paragraphs of narrative, 5 sets of election results and 213 references comprising the voluminous Wikipedia page attributed to Maricopa County, Arizona Sheriff Joe Arpaio – who has devoted much of his life to the defense and protection of others – has diversion & cover-up regarding said “interregnum” written all over it, thus could constitute but exaggerations & red-herring lies in support of political persecution under-color-of-law; or to quote “Voltaire”, evil hides in the mind, not on the face. As usual, you nailed it, John. We just need to make sure we can distribute informative pamphlets that are easy to comprehend so that more of the public is educated about sharia, and the goal of the Islamists. Counter Jihad Coalition (CJC) is doing just that at malls in So. Cal. Thanks for all you do.